Two items of sad news breaking this morning. 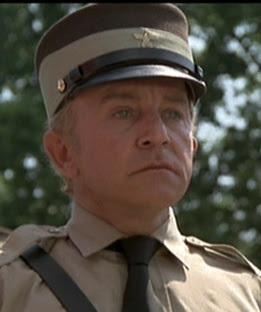 The first is that veteran actor Henry Gibson has died at age 73. He was one of the original cast members of Rowan and Martin's Laugh-In, where he made regular appearances as the flower-bearing poet who would stroll onstage and deliver a funny poem. He also appeared during each episode's "party scene" as a priest-type character invoking religious humor ("My congregation supports all denominations, but our favorites are twenties and fifties."). Over the following years and decades Gibson racked up an impressive filmography, including voicing Wilbur in the animated film of Charlotte's Web (I had no idea that was Gibson's voice until this morning), Kentucky Fried Movie, InnerSpace, and recently in a recurring role on Boston Legal. However I'd bet that most people reading this will especially remember Gibson's uproarious portrayal of the Head Nazi in The Blues Brothers. Gibson also wrote songs and books, including more of his poetry. Sounds like he was an all-around talented fella. He will certainly be missed. And then last night came word that Mary Travers, whose voice endeared itself to generations as part of the musical trio Peter, Paul and Mary, has passed away at age 72 following a battle with cancer. Thanks for the good tunes and the great memories, Mary.